← What is cascade fermentation? In winter it is not just the cold air outdoors but above all the dry air from heating in the home as well that provide ideal conditions for flu viruses. So why not deal with the cause at its roots! For reducing the risk of an influenza-like infection it is not just a healthy diet and lifestyle that helps, but increasing the level of humidity in the home as well. Above all, we breathe more lightly and easily if the air in the home is more humid, and neither a dry nose or mouth cause us any problems if that is the case. But what we take for granted in the summer months can also be made possible during the colder months by resorting to a few simple aids: all of us know the little home remedies for increasing the air humidity of heated rooms. We place a dish of water in the room or dry the washing in the living room. Not forgetting radiator hangers that can be filled with water. However, in most cases we don’t really notice much effect and often get annoyed about the less than ideal atmosphere in the home. 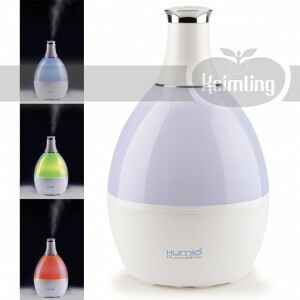 Raw food lifestyle thanks to the Humio air humidifier: quite simply aesthetic and effective! Unlike conventional methods, the Humio Air Humidifier not only creates pleasant indoor air quality by gently turning water into mist, it also serves as a night light or designer lamp, because it has a changing spectrum of colours. In this way the Humio creates a pleasant wellness atmosphere in the home, with soothing light and optimised air humidity. At the same time it is easy to use and fill with water, and since the water is turned into mist by ultrasonic vibrations there is not the slightest risk of burns.